Mentigen View Point of Bromo is an alternative place to see the sunrise and sunset on Mount Bromo, besides the main viewing place Puncak Penanjakan 1 (Climbing Summit 1). This summit is mostly known as Penanjakan 2 (Climbing Summit 2) of Mount Bromo and this spot is also close to the hotels in the area. Unlike the climbing route on Penanjakan 1, you don’t need to rent a jeep or hardtop to reach the summit. You just need to reach the spot by foot from the hotel or homestay at Bromo to a hill that gives similar view like in the Penanjakan 1 of Bromo. Most tourists that choose to view sunrise in Mentigen View Point of Bromo are usually those who cannot wake up early before the first light of sunrise coming up. Because of the limited time and it is impossible to climb Penanjakan 1 to see the beautiful sunrise, they choose to climb Penanjakan 2 that doesn’t take much time to reach the summit. Mount Bromo is one of the most amazing mountain in the world. The nature process of the mountain and caldera forming look awesome for the gorgeous typical look. The amazing beauty can be enjoyed from many spots surrounding the mountain and Bromo Tengger Semeru National Park. Every spot of view point gives unique perspectives but still gives awesome look about the mountain, including on the Mentingen Summit. Many tourists and all tour guides in Mount Bromo said that they can see the wonderful natural beauty of the mountain even though in different view point or perspective. 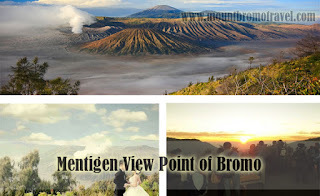 That is why the tourists can see the view of Bromo from any spots available around the mountain. On the Mentingen Summit at Bromo, the tourists find a great alternative spot to see the sunrise. They make the moment more memorable by taking some pictures of mountain; as one of the most amazing tourism destinations in the world. Many photographs that have been taken and published on the internet make all people all over the world amaze the awesome view. It then invites many tourists from all over the world to come to Mount Bromo and be the evidence of the awe-inspiring beautiful view. As the increasing of the popularity of Mount Bromo in the world, there are many more tourists that come to see the great mount and stunning sunrise view from the back of the mountain. The main view point Penanjakan 1 is always full of tourists, especially in holidays. When you visit Bromo in holidays, you can choose Mentigen View Point of Bromo as the alternative that can give the view in different perspective but in the similar beauty.